Have you ever heard of the word yumtastic? Well, that's what these babies are. Yumtastic. I'm super excited to have made these for 4th of July yesterday for three reasons. 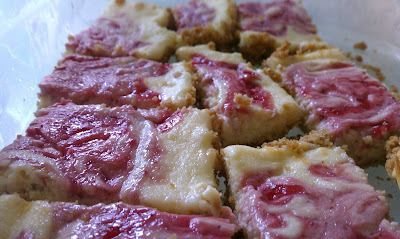 A) They were my first cheesecake bars. B) They are red and white! All I was missing was blue for the occasion. Darn. C.) They were the very definition of yumtastic. My mom even loved them and she is very, very particular about her desserts. So about these bars. They start with a crumbly graham cracker crust, topped with a creamy, light and sweet cream cheese filling, and are swirled with a sinful strawberry sauce. 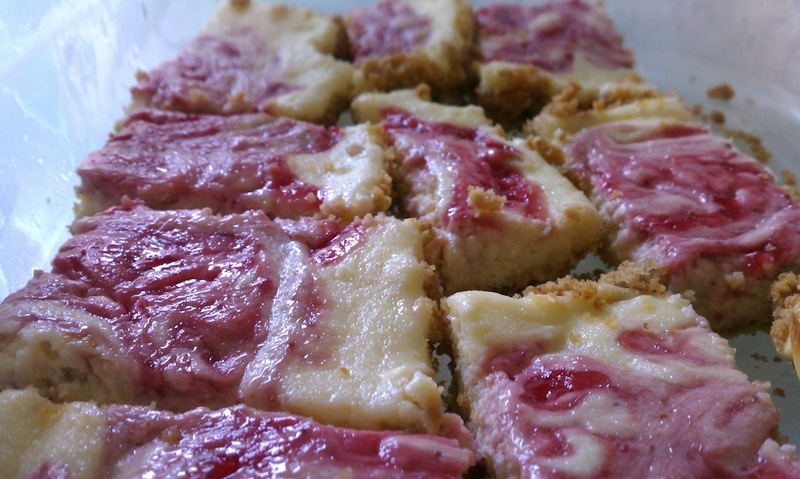 They're downright decadent, and easier to make than a regular cheesecake. What's not to love? Preheat your oven to 325 degrees. Grease a 7x11 inch baking dish. Line the greased baking dish with parchment paper, making sure to press down in the corners so it sticks. Set aside. Place your graham cracker squares in a large, sealed freezer bag. Use a rolling pin to crush up your graham crackers in the freezer bag into fine crumbs. Place your graham cracker crumbs in a large mixing bowl along with the sugar and cinnamon and mix together. Slowly, drizzle the melted butter all over the graham cracker mixture and combine well. Press mixture into your baking dish and bake in the oven 10-12 minutes or until golden brown. Let cool completely. In a saucepan over medium heat, combine the strawberries, sugar and water. Let mixture come to a boil, and let boil for 5 minutes or so, until most of the strawberry juice remains. Stir in the cornstarch and let cook another 5 minutes. Pour the strawberries with their juices into a blender carefully and blend until a strawberry sauce is formed. Pour into a heat-safe bowl and let cool. Preheat your oven to 325 degrees. Beat together the cream cheese with the sugar, egg, and vanilla extract until fully combined and smooth. 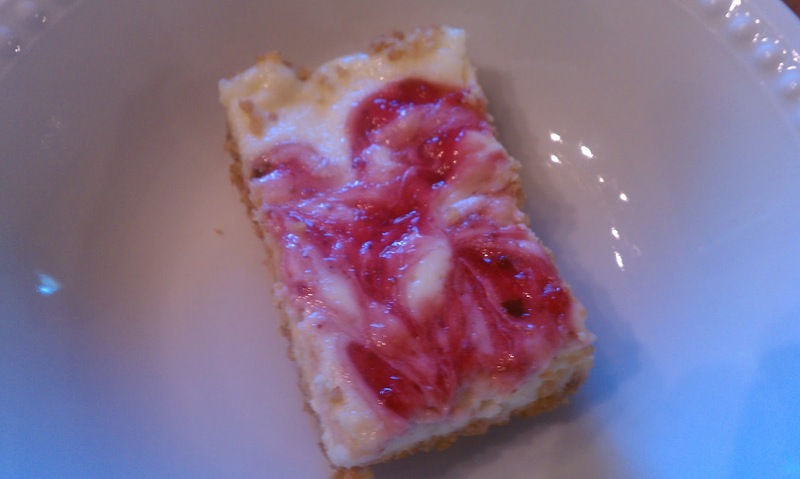 Use a spatula to spread your cream cheese mixture over the cooled graham cracker crust evenly. Spoon large dollops of the cooled strawberry sauce atop of the cream cheese mixture. Using a knife, make figure eight swirls with the strawberry sauce over the entire cream cheese mixture. Bake in the oven 25-30 minutes, until center only slightly jiggles. Set aside to cool completely before refrigerating. Refrigerate 3-4 hours before serving and cutting into squares. 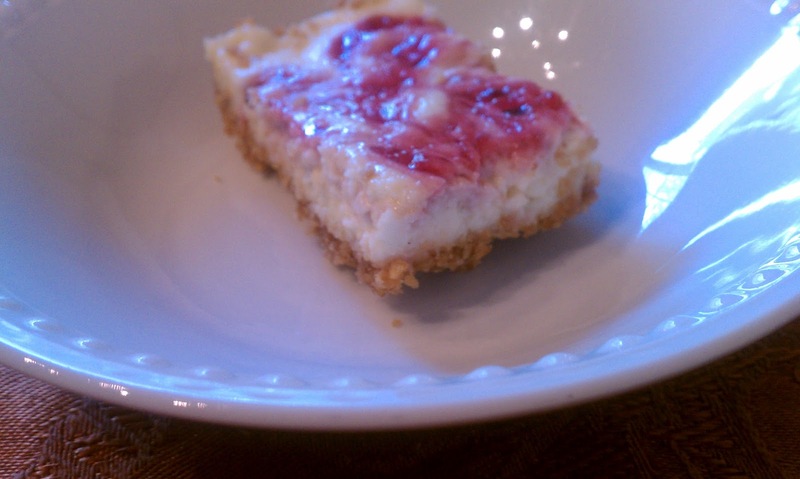 Makes about 10 cheesecake squares.